The first stage of prosthetic therapy is the provision of an interim prosthesis. This will usually happen during the first few weeks following your amputation. The purpose of the interim prosthesis is to encourage early mobility and commence gait re-education as soon as possible. Following an assessment, the prosthetist will take a plaster cast and the interim prosthesis will be manufactured and fitted. 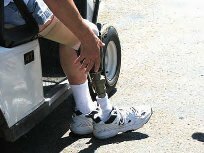 Your interim prosthesis will require regular modification as your residual limb changes in shape and volume. After approximately 3 to 6 months the prosthetic interim socket may be replaced with the first definitive socket. One of the most important things following an amputation is getting your life back to the way it was prior to the amputation. Obviously some changes will need to be made and you will have to face daily challenges, but most of these can gradually be overcome in time. Becoming an amputee may mean that you can do most of the things you used to do in a different way and sometimes it’s just a matter of careful planning, organisation and learning as you go along. How long it will take before you are ready to go home will depend on the type of amputation you have and your general state of heath. It is common to be transferred to another hospital or ward for a period of rehabilitation following a leg amputation. This is usually done when you no longer require the facilities of the surgical ward. Before you go home, it is likely that an occupational therapist will arrange a visit to your house to see if any aids are needed to make your environment safer and more accessible. Things such as flooring, stairs and bathrooms may need to be modified. Below are a number of suggestions that can make that first time a little easier for you and your family. Use temporary portable ramps if necessary to gain entry into the house; in time you may require permanent changes to be made. Attach hand rails for steps and stairs to assist with balance, stability and safety. Arrange things so that they are in easy reach to enable you to do things for yourself. Returning to work can be a significant milestone in your rehabilitation. You may or may not be able to perform the same role you did prior to losing your limb/s. Many companies offer return to work programs and the Government has programs in place to assist you to make the transition easier. Modifications may be made to your workplace to aid in your return. It is a good idea to stay in contact with your employer during your absence and discuss future possibilities.